I will fully admit to my bias towards Unbreakable. I think he is the Alfred Hitchcock of our time, not an original comparison of mine. 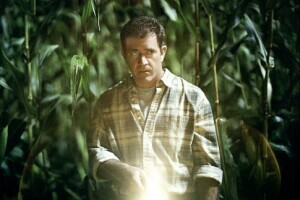 Signs is one of the best suspense movies ever. Shyamalan takes a ho-hum basis for a story but builds it up to one of the best movies of the year. It's smart, full of suspense, and deep. A quick warning, this review contains spoilers. Please avoid reading it until you've seen the movie. We don't get too many moments of real happiness in our lives, don't spoil this one. Early on in the film, Merrill (Mel Gibson), to get pissed off and run around the house swearing at the redneck neighbors who seem to be causing them some trouble. Unable to fit into that character, Graham ends up shouting "I am filled with anger!" Gibson's ability to fill the role of the fallen priest, peeled back layer by layer during the picture, helps us not only discover more about who he is, but why he came to be. With each character we peel back layers of the past and details of their depth. This beats the typical subplots most writers use to sell their characters. A great blending of humor in the most stressful of situations also helps constantly shift our emotional ties from horror to laughter. While Graham goes out to explore he tells his two children to take off the tin foil helmets they wear to protect them from alpha waves. When he returns from his first physical encounter with one of the mysterious beasts, he finds his 25 year old brother has donned one as well. The two scariest things I ever saw were footage of bigfoot walking in the woods and a video of UFOs floating over a kids baseball diamond. They weren't scary because of the content, they were scary because they were real. Signs plays off of this fear with a horrifying discovery at a children's birthday party shown over CNN. M. Night knows exactly how to play the audience. At the moment of greatest horror, the moment where we feel like we want to crawl under our seats until the usher pushes us out with his big nasty mop, Graham quiets everything down with a story of the birth of his children. We need it as much as the children do. The DVD of Signs is excellent. There is a beautiful 1.85 to 1 16x9 enhanced picture with excellent detail, sharpness, and color. I found my eye picking up bits I had missed in the theater. The alien's skin having shifted to the patter on Morgan's flannel shirt, for example. This movie is one where a discreet 5.1 sound system is critical. The most terrifying scene in the movie would be flat as a four day old glass of soda without a solid Dolby Digital 5.1 sound system. The DVD includes a commentary with the director, some extra footage and featurettes, and the THX Optimizer, critical for properly tuning your home theater system. The content and quality of this DVD give it a five star reference quality rating according to the Liquidtheater Science Board (LSB). M. Night's accomplishment with Signs isn't an original plot. He proves that plot matters very little when making a good picture, its you do with it. Signs won't impress anyone with a description of the story, but it will impress a whole new look at a story that's been done hundreds of times. M. Knight's ability to create realistic characters and his masterful weaving of terror are what set Signs apart.